INTERBERING. A Railway From Canada To Alaska: Ready To Be Built In Six Years by Fyodor Soloview. A railway connecting Alaska to the lower 48 states has never been as close to realization as it is at present. Only $4.5 million, to enable the securing of an operating line of credit for a feasibility study, is needed for the Canadian company Generating for Seven Generations, Ltd. (G7G) to launch this long awaited project. 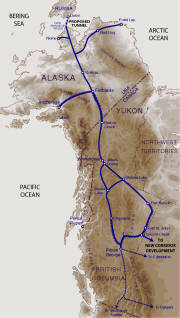 It has been assumed that a railroad to Alaska cannot be built by Americans or Canadians on their own, despite the fact that Interior Alaska and Canada residents face each winter season with crushing energy, food and materials costs - due to the reality that all freight must be shipped either by air or by sea. 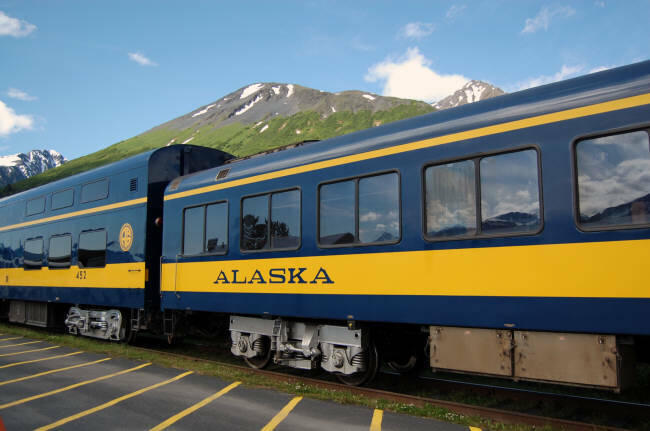 Bruce Carr, Director of Strategic Planning for the Alaska Railroad Corporation, said in July "It's a mind-boggling project for the American side, and the federal government would have to help support it." But federal government support hasn't been offered even though a direct railway connection would generate hundreds of thousands of jobs during and after construction, thus aiding our fragile U.S. economy. All the latest plans of developers to bring a railroad through to Alaska are therefore based on the idea of incorporating it into a global intercontinental railway project with Russia - together with the construction of a tunnel under the Bering Strait. This would make project construction more profitable for private investors. But even this faces its own difficulties, like the inability of past Russian and U.S. leaders to sign a joint treaty. Finding investors who will pay up to $100 billion for the laying of 2,400 miles of rail through undeveloped regions of Siberia to the Chukotka Peninsula in Russia, plus 3,000 more miles in the U.S. and Canada, and digging a tunnel under the Bering Strait, is also a challenge. Support for a Canada-Alaska railroad, however, grows along with each new rise in the price of oil, the growing demand in Asia for new oil sources, and the simple fact that Canadian natural resources - especially in the Western Provinces of British Columbia, Alberta and Saskatchewan as well as the Yukon Territory - have difficult access to Pacific ports. Many Canadians, led by the First Nations, are in favor of extraction and export of natural resources. But many are also opposed to oil tankers sailing from Canadian ports. Any proposal advocating supertanker expansion in BC coastal waters are fought by First Nations, which seek to protect their territory using traditional, cultural and legal arguments. Under the guidance of Canadian businessmen Matt Vickers, Ward Kemerer, Tom Jackson and Len Wilson, G7G Ltd. continues to plan for a rail line transporting oil sands from the Ft. McMurray and Peace River regions of Alberta to a point near Delta Junction, Alaska. There, oil would move into the Trans-Alaska Pipeline System (TAPS) for transport to the oil terminal in Valdez and loaded into tankers. "This rail project may be made economically viable because of the controversy of both the Keystone pipeline, designed to move Canadian oil-sands products to the Gulf Coast, and the plans to turn Prince Rupert and/or Vancouver, BC into oil supertanker terminals for shipment of oil sands products to Asia, California U.S. and European markets," says Luke Hopkins, Mayor of Fairbanks North Star Borough in support of the G7G initiative. G7G is also receiving enthusiastic support for the project from the Alaska and Yukon governments, and looks forward to First Nations of Canada, tribes of the United States, and federal government support in addressing aboriginal title and rights concerns. G7G has likewise formed a partnership with the reputable engineering firm AECOM to verify that the rail project is viable. AECOM is a global provider of technical and management support services to a broad range of industries including transportation, facilities, environmental, energy, water - as well as to government. AECOM is ranked as the #1 Design Firm in the 2011 Engineering News Record; and they are ranked by Ethisphere as one of the world's 110 Most Ethical Companies. AECOM has produced a scoping document using industry proven methodology confirming that the G7G rail project is indeed viable. It shows that G7G will be able to transport oil sands products competitively in all aspects - including economics, timelines and most importantly, safety. Project viability was analyzed assuming an export rate of one million barrels per day (bpd) of oil products. "Currently, TAPS is running at less than one-third of its designed capacity of 1.8 million to 2 million barrels per day. A pipeline on wheels could deliver to Alaska enough oil to fill the pipeline to capacity, as well as utilize the excess capacity of the Flint Hills Refinery near Fairbanks for refining into ultra-low sulfur aviation, maritime, and home heating fuels," adds Luke Hopkins. A rail connection will also allow for oversized, super-heavy dimensional loads of specialized oil sands upgrader cargo, through Alaskan ports such as Seward, Whittier, Anchorage and Port MacKenzie. This is a troublesome bottleneck issue for critical equipment en route to Alberta. For example, port access in Alaska will allow Asian shippers to unload their cargo bound for U.S. and Canadian markets closer to the point of origin - greatly speeding up delivery and turn-around times. Furthermore, connection of rail to Alaskan ports will greatly enhance the economic viability and development of vast mineral deposits located on First Nation and Alaska Native lands along the rail corridor. The economic, social, and strategic value of this project cannot be overstated; this rail-line will be the key factor in development and economic sustainability for peoples along the entire route. Sean Parnell, the Governor of Alaska, wrote to G7G in July that "the potential economic benefits of a rail link for both Alaska and Canada have been a vision as far back as the Harriman Expedition in the mid-1800s. Tremendous mineral wealth also exists along and near the rail corridor." 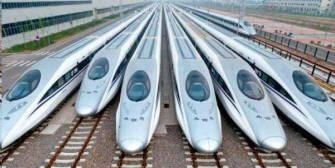 "In 2005 Alaska and Yukon agreed to jointly contribute $5 million towards Phase I (www.interbering.com/Feasibility-Study-Reports.html) of an Alaska-Canada rail link study," he added. "Just this year, the legislature appropriated an additional $1.1 million to the University of Alaska to begin Phase II of that study. Interest by my administration and the legislature for potential economic benefits of a rail link remains strong, and this work will be complimentary to the G7G feasibility efforts." "The two-track, Canadian-Alaska railroad will be built by the year 2018, if we get the required $4.5 million and start working now," says Ward Kemerer, G7G Director. The construction of a Canada-Alaska railroad would have an additional impact on the proposed America-Russia railroad. 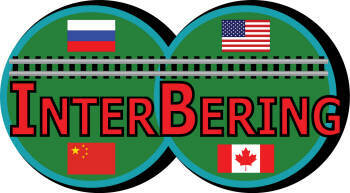 If this connection happens soon, then the part on the American continent of international track (a 1,300-mile bit between Fairbanks and the Bering Strait) can be completed by 2024 - six or more years earlier than the Russian railroad to the coast of the Bering Strait from Yakutsk. That might give the U.S. an opportunity to dig the entire 64-mile Bering Strait tunnel using its own financing and labor force. This could potentially give more control over key aspects such as tunnel maintenance, security, customs and operation schedules - including land on the Russian side to house workers, etc. G7G, the planner of the Canada-Alaska railroad, has already secured lending for the $8-12 billion rail line build, and is preparing to conduct a feasibility study to verify the business plan (anticipated cost of $40 million). A secured lender will front $100 million of their corporate bonds to be insured at $4.5 million to enable G7G to secure an operating line of credit in order to conduct the feasibility study. The security for the $4.5 million is an additional $10 million bond. G7G is seeking $4.5 million to complete this portion of the project. G7G will repay the $4.5 million within 45 days plus generous interest. 604-261-3733 (cell: 778-239-1440). Website: http://www.unfnrailco.com. CANADA FINANCIAL POST: Alaska-bound rail project could solve Canada's oil sands problems. By Diane Francis. November 16, 2012. ALASKA DISPATCH: Alberta-Alaska railway: Will it be built? November 18, 2012. YOUTUBE.COM: Matt Vickers CEO of G Seven Generations Ltd. November 27, 2012. INTERBERING: Modern Railway Project Could Serve the Northern Peoples as well as Solve Canada's Oil Export Problems. By Alf Nunweiler. December 15, 2012. 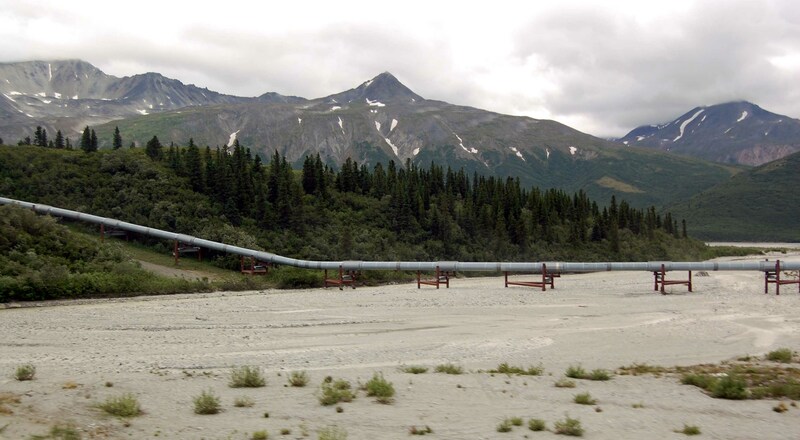 Oil pipeline along Richardson Hwy in Alaska. The Trans-Alaska Pipeline System (TAPS) includes the trans-Alaska crude-oil pipeline, 11 pump stations, several hundred miles of feeder pipelines, and the Valdez Marine Terminal.